The blog has written a lot about the Soviet boats fishing off the West Coast of the United States during the 1960s. But there weren’t just Soviet boats. Dayton Lee Alverson has told us about the day in March of 1959, when the Seattle Times asked him to identify the flotilla of fishing boats the U.S. Coast Guard found in the Bering Sea. And Bob Hitz has told us about flying over the fleet when it reached the Washington and Oregon coasts. The Soviet ships moved into the Gulf of Alaska in 1962, and to the Aleutian Islands in 1963; by this time, they are fishing year round for herring and bottomfish. They moved steadily southward, reaching Washington and Oregon in 1966. Trawl fishing effort for groundfish by foreign and domestic fishermen, 1962-1983.
vessels arrived in 1974, two trawlers from West Germany in 1975, and two vessels from Bulgaria and Taiwan in 1976. Reported catches peaked at 237,000 mt in 1976. Note that the figure is for reported catches; there is plenty of speculation that the actual catches may well have been higher. Protests over the foreign boats led to passage of the Fisheries Conservation and Management Act (the FCMA) in 1976. With that expansion of territorial waters to 200 miles, Congress was finally able to control foreign fishing in American waters. Fishing was limited to the USSR and Poland. The peak number of vessels on the grounds was more than 100, in 1974, and total catches peaked at 254,000 million mt in 1976 and averaged around 170,000 tons between 1966 and 1978. In 1978, U.S. fishermen began to deliver fish to Soviet vessels for processing, starting what came to called joint venture fishing. 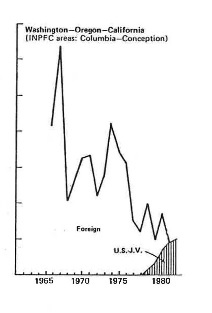 The two graphs are from a Northwest and Alaska Fisheries Center report, 85-02, “Fishing efforts by net fisheries in the North Pacific and Bering Sea since the 1950s,” written by R.A. Fredin in January of 1985. It’s difficult to get an idea of the magnitude of the fishery but it is totally clear about the trajectory, a steep peak, then a rapid decline. The foreign boats had a big impact on West Coast trawl fishermen like George Moskovita. And a worse impact on the stocks of Pacific Ocean Perch. A.T. Pruter, “Soviet Fisheries for Bottomfish and Herring off the Pacific and Bering Sea Coasts of the United States,” Marine Fisheries Review, 38 (12), December, 1976, 1-14, 2. 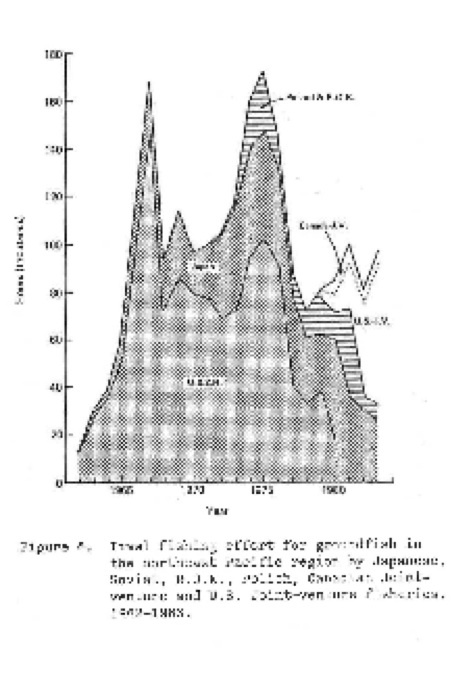 Robert C. Francis and Anne B. Hollowed, “History and management of the coastal fishery for Pacific Whiting, Merluccius productus, “ Marine Fisheries Review, 47 (2), 1985. 95-98, 95. Robert French, Russell Nelson Jr., and Janet Wall, “The foreign fisheries off Washington, Oregon, and California, 1977-78,” Marine Fisheries Review, 45(3), 1981, 36-44. This entry was posted in Carmel Finley, Dayton Lee Alverson, Environmental History, Fisheries policy, Fishing, History of Science, Marine Policy, Maritime History, Ocean fishing, Pacific Fishing History Project, Sebastes rockfish, Soviet environmental history, Soviet fishing. Bookmark the permalink.